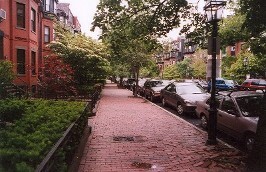 Modest dimensions for streets, destination distances and building setbacks. In town centers, in nearly all cases, residential single-family, residential multi-family, commercial and civic uses should all have on-street parking. Why? 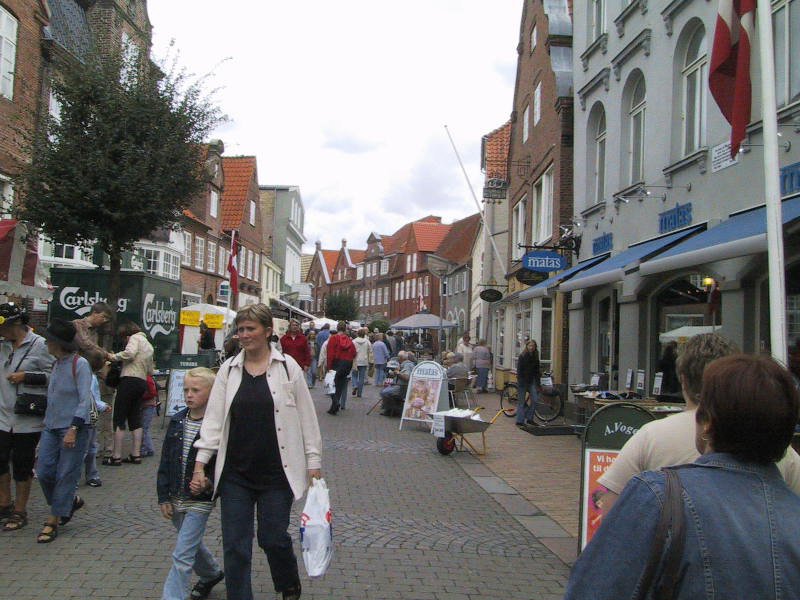 Because one of the most effective, low-cost ways to achieve the above three design imperatives is to provide as much on-street parking in a town center as possible, for all land use categories. As one moves out of the town center, design starts incrementally changing. In the first few rings outside of the town center, transit and bicycling become the imperative. Speeds increase and dimensions, the distances, and the building setbacks are larger. Bike lanes become more appropriate and on-street parking becomes less appropriate. In the more drivable outer suburban rings, cars become the design imperative. Speeds are relatively high, as are sizes. On-street parking is largely non-existent, and bike lanes become rather important and appropriate. 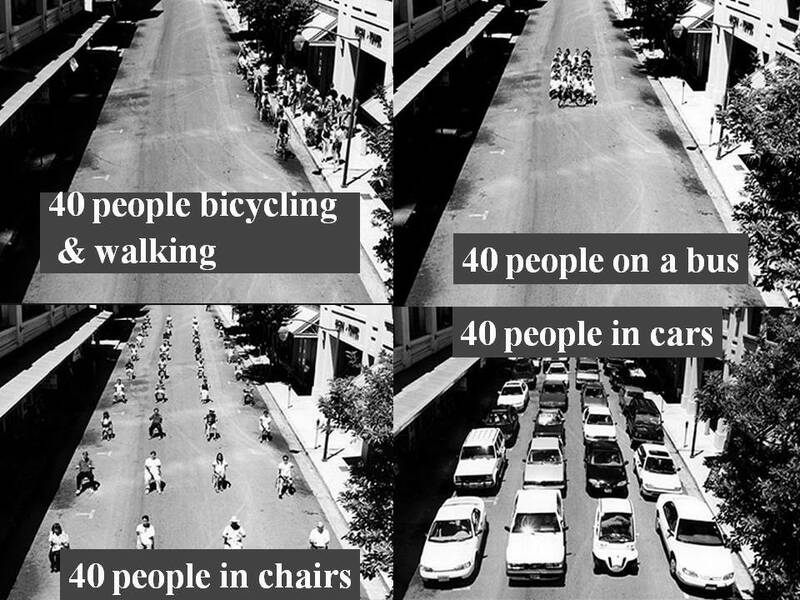 When we take actions to ease car travel, there is no win-win. Providing for cars is a zero-sum game. That is, each time we make car travel easier, we make travel more difficult for bicyclists, pedestrians and transit users. Providing for cars is also a recipe for downwardly spiraling quality of life for the community. Using “level of service” (LOS) as our measure (a measure of how congested a road is with cars) implicitly assumes that congestion is an accurate assessment of quality of life. But using LOS perpetuates this ruinous assumption that free-flowing traffic and quality of life are one in the same. We need to ask other, more appropriate questions to measure quality of life: How healthy is the retail? The town center? Are large numbers of tourists interested in visiting? Are there lots of bicyclists? Transit users? Pedestrians? How expensive is town center housing compared to similarly-sized cities? Are residents proud and protective of their city? An unintended consequence of using LOS as a measure is, as I mention above, perpetuating the asking of the wrong question. Asking about LOS distracts us from asking better questions along the lines of those questions I suggest above. Asking the right question is often the crucial first step in taking beneficial actions (or, in science, solving puzzles in the field of research). Long ago, we didn’t reduce the cholera epidemic by measuring how many prayers were said. We asked how we could reduce contamination by bacteria. Many find bicycling to be rather inconvenient for a number of reasons, which discourages bicycle commuting. Bicycling in America is already vastly inconvenient. Distances tend to be excessive. Weather must be contended with. Cargo carrying is rather difficult. Compared to a motor vehicle, speeds on a bicycle are relatively slow when distances are relatively long, and hill climbing can require significant physical exertion. A growing problem with regard to bicyclist inconvenience is the well-meaning transportation safety advocates, who often support adoption of laws that require bicyclists to use “safety” gear. Or otherwise ride more safely. Bicycle helmets. Reflectors. A requirement that a bicyclist come to a full stop at a stop sign. 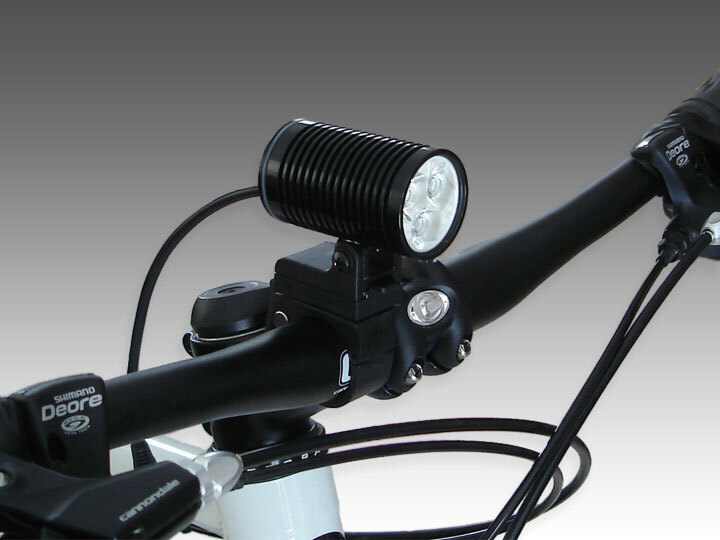 Requiring bike lights on bicycles adds a further inconvenience. Unlike motorists (who already have a number of conveniences over bicycling), a bicyclist must remember to bring along and attach a light to their bike, store or otherwise keep track of the light when they have taken it off (to, say, go into a store or restaurant), and contend with the on-going hassle of batteries and the corrosion that can lead to non-functioning bike lights. Leaving the light on the bike risks the inconvenience of theft. Recently, I was bicycling home at night from a dance that was a number of miles away from my home. While riding, a police officer pulled me over and was kind enough to issue me a warning rather than a ticket, since in Colorado, bicyclists are required to use a front light at night, and I was not doing so. An unintended consequence, then, which hardly seems societally beneficial, is that laws requiring lights on bicycles can result in more car travel and less bicycling. Is that a preferred outcome in a world where more bicycling and less driving is important? A colleague of mine who is active in promoting bicycling rightly points out that requiring bicycle lights by law would add to the difficulties that low-income citizens already face when they are considering bicycling as a way to travel. She also notes that there are already quite a few laws regarding bicycling that police officers often use to harass bicyclists. This is not to say that all or most officers engage in bicyclist harassment, but there will always be some who will for various reasons, and laws tend to be on the books for generations. We don’t need to add to what, in my opinion, is the inequitable police harassment of bicyclists. In my experience, even though bicyclists pose little threat to others, they are ticketed for running stop signs and red lights or not coming to a full stop far more than is necessary, given the minimal threat to others when the bicyclist does such things. I say this even though I acknowledge the desirability of bicyclists following traffic laws (because, for example, it promotes their safety and builds respect from motorists). Let’s be very, very careful about adopting new laws for bicycling. The chances of unintended consequences are extremely high. In my view, my skill set has never included effective persuasiveness. (a reason I’d never be elected to office). I am, however, cursed with strong opinions that I am mostly unable to repress. Because he is a better writer than I am, David Owen has written an extremely provocative and persuasive book entitled The Green Metropolis. His book makes the rather counter-intuitive yet compelling argument that high-density cities are the most eco-friendly communities in America. That is, their design promotes very low-impact lifestyles—particularly in minimizing car travel. Planners and elected officials often strive to influence people to live in more “sustainable” or “socially desirable” ways. Over the years (and in particular, reading a number of authors on the topic), I’ve come to realize that change in behavior or beliefs is largely driven by material conditions (not to suggest that I’m sympathetic to Marxism or socialism). 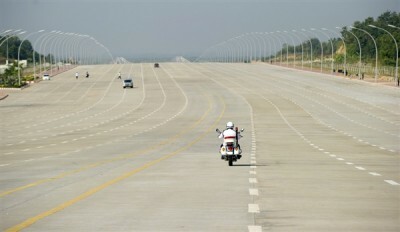 Behaviors and beliefs arise due to prices, costs, benefits, roads, parking, distances, speeds, economic conditions, etc. An idea can be brilliant, but unless these material conditions promote the idea, the idea will be largely ignored. (for example, water conservation is more common in the western US not because residents there learned wonderful ideas from books or speeches about conserving water, but because water is relatively scarce in the west). I’ve learned, again, that because material conditions are largely the origin of ideas and behaviors, ideas are mostly useless (unless the timing is right). By realizing this, I’ve mostly avoided banging my head against the wall. I’ve mostly avoided being frustrated by my inability to convince people of my views. I mostly like to point out, when asked, the tactics that I believe are most effective in achieving an objective. “How can we get more transit riders, Dom?” I respond by pointing out we need priced and scarce parking, relatively high gas prices/gas taxes, priced roads, compact and mixed-use development, etc. I don’t expect anyone to agree. At least not in the world we currently live in. I think that planners can be most effective if they can leverage the tactics that effectively influence behavior and ideas. For example, successfully influencing the size and pricing of roads, the amount and pricing of parking, the amount of gas taxes charged, the amount of impact fees charged, where buildings are placed on a piece of property, etc. Each of those tactics are effective in changing behavior and ideas. I have spent much time and effort striving to speak (and write land development regulations and plans) in “Plain English.” I sincerely dislike the obfuscation of bureaucratese and legalese. On a related topic, I’ve always strived (and mostly failed) to select words that would better resonate with people (coincidentally, I’m now a “complete streets” instructor in cities throughout the nation, and believe the term strongly resonates with most). Many town planners have the bad habit of making people feel like they have an undesirable lifestyle (from a societal point of view)—that they are bad people. This is an important reason why I frequently make it a point to mention and promote, in speeches and writings, the concept of the rural-to-urban transect that new urbanists are fond of, because I believe it is an effective, equitable way to give some level of acceptance to the full set of lifestyle choices. Of course, there are less socially desirable behaviors, and I believe that while such behaviors should be reasonably allowed, they shouldn’t be allowed at the expense of others. Many citizens have beliefs or desires that originate from market-distorting subsidies (such as underpriced roads, parking or gasoline). So I believe that the planner must find a proper balance between actually hearing and responding to “real world” citizen needs/beliefs, and advocating tactics that they, as professionals, know to be effective in achieving community objectives. On this topic, I often like to surprise people these days by pointing out that town center living is shown in studies to be safer, more convenient, cheaper, and easier to travel in than suburbs. If these studies are accurate, and I believe they are, should I be dishonest and agree, as a planner for a town, with citizens who state the opposite? In such a discussion, by the way, I don’t ever feel as if I would be able to persuade people that town centers are better in these ways. I believe, again, that most people will be convinced, over time, of these things as gas prices rise, roads and parking are priced, a growing number of people (particularly the wealthy) start living in town centers, the cost and profitably of town center properties rise, etc. Now that I think about this issue, it occurs to me that I have found at least one way to be persuasive on topics such as these: Using photos in PowerPoint presentations. When I use certain images, my point can become vivid, rather undeniable, and accessible to the most un-schooled of audiences. I’ve always liked this comment from Reubin Askew: A leader is someone who cares enough to tell the people not merely what they want to hear, but what they need to know. I think that elected officials are (or should be) elected to be leaders. To do meaningful things, leaders know that they will make enemies – at least in the short run. Margaret Thatcher once said that consensus is the absence of leadership. One of my heroes – Enrique Penalosa (former mayor of Bogota) – was despised early on in his term. He enacted policies that aggressively inconvenienced cars in his efforts to make people, rather than cars, happy. Many wanted to throw him out of office. But eventually, his policies (which nearly all his citizens strongly opposed initially) resulted in visibly obvious quality of life and civic pride improvements. He went on to become much-loved and honored by most in Bogota. 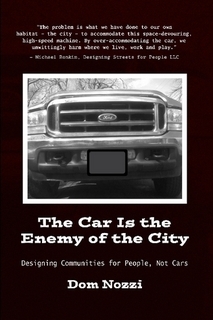 * A city can be friendly to people or it can be friendly to cars, but it can’t be both. * Over the last 30 years, we’ve been able to magnify environmental consciousness all over the world. As a result, we know a lot about the ideal environment for a happy whale or a happy mountain gorilla. We’re far less clear about what constitutes an ideal environment for a happy human being. One common measure for how clean a mountain stream is, is to look for trout. If you find the trout, the habitat is healthy. It’s the same way with children in a city. Children are a kind of indicator species. If we can build a successful city for children, we will have a successful city for all people. * God made us walking animals—pedestrians. As a fish needs to swim, a bird to fly, a deer to run, we need to walk, not in order to survive, but to be happy. *A premise of the new city is that we want a society to be as egalitarian as possible. For this purpose, quality-of-life distribution is more important than income distribution. [And quality of life includes] a living environment as free of motor vehicles as possible. * Anything you do to make a city more friendly to cars makes it less friendly to people. If I (or an American elected official) were to state anything like the above quotes, what would the reaction be? Surely such quotes would be opposed vigorously by some. But such opposition must be expected for meaningful leadership. Elected officials need to acknowledge, sometimes, that public sentiment might be counterproductive (particularly in a world where misguided public subsidies and laws encourage dysfunctional behavior and ideas). Sometimes citizens desire things that will undercut societal objectives (that is, be detrimental to overall community quality of life). Sometimes you need to make enemies. Sometimes consensus leads to ruin. I believe that sometimes, if a half-hearted approach is taken on, say, a traffic calming or transit project (due, usually, to compromise), the implementation can give the concept a black eye. I’ve been reading recently about the issue of “confirmation bias,” where your frame of reference leads you to tend to accept information that bolsters your perceptions and reject information that does not. One antidote to this mistake is my reading The Structure of Scientific Revolutions (Thomas Kuhn). From that book, I learned that when we devote a great deal of time and effort working with a certain paradigm, we can become immune to data that undermine the paradigm – even if the data is overwhelming. Most of us are incapable of admitting to ourselves the tragic thought that we’ve wasted so much of our lives on a failed idea. Many of us go to our graves without being able to change our viewpoint. It is only when the old guard dies off that the new paradigm can emerge and be accepted. Formerly, I made the mistake of thinking that overwhelming data, evidence and logic would pretty much always carry the day and be convincing to most everyone. I now know better. Late in my career as a town planner for Gainesville FL, I received a very kind note from a student seeking advice in what studies to pursue in college. When I hear comments such as his, it truly makes my writing efforts seem so much more rewarding and gratifying. I was very pleased to hear that my thoughts about SUBurban sprawl (“urban” sprawl is a misnomer) had been so influential to him. He complimented me and asked for career guidance. He asked about my academic background, and what path he could take so that he could help make the world a better place as a town planner. My academic background is that I originally obtained a bachelor’s degree in environmental science, but realized that I have strong opinions and a desire to help elected officials make better decisions about how to improve the quality of life. Working with test tubes in a lab did not seem like a very effective way to achieve that. Because I’ve always read a lot and have a bit of knowledge in a lot of topics, I came to decide that town planning will be a satisfying way for me to best use my skills and interests (since the profession tends to be relatively “generalist” rather than “specialist”). My planning job consisted of my writing land development regulations, long-range town plans, preparing professional recommendations to my city about the benefits and costs of a proposal to rezone land in the city (by a property owner), making presentations to the elected and appointed officials, and preparing planning reports. Mostly, the work I was asked to do focused on making cars happy (telling developers they MUST provide a huge amount of parking) and working on ways to reduce the negative impacts of cars on neighborhoods (mostly by requiring walls and berms and huge, unwalkable building setbacks). Based on my experience, I would strongly recommend that your studies emphasize design rather than my academic emphasis of policy. And the design I would recommend you concentrate on is traditional, new urbanist town planning principles – an emphasis that strives to return to the timeless tradition of designing for people, not cars. I believe there are websites such as cnu.com where you can find listings of schools throughout the world which specialize in traditional, new urbanist design. The University of Miami School of Architecture is an outstanding example of such a school in the US, as is the University of Notre Dame. 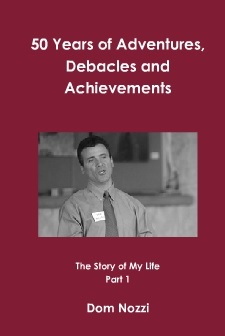 I would also recommend books to you, as listed on my walkablestreets.com website. Ultimately, you may find, as I did, that a job in the private sector would be much more pleasant and rewarding than a job working as a planner for a public agency (city, state, county, etc. ), as the later tend to be strongly opposed to the planning principles I recommend. In general, that would mean seeking to be hired by a firm using new urbanist principles, such as those listed on my walkablestreets.com website. You may also find it very helpful to watch presentations found on the internet (YouTube, etc.) by such people as Andres Duany, Jim Kunstler, Michael Ronkin, Ian Lockwood and Victor Dover. I envy your life situation, as I wish I had gotten the suggestions I mention above when I was starting out my college career. I ended up being mostly self-taught. It is a tactical mistake for those promoting active transportation to seek to demonstrate (or otherwise argue) that building new facilities for bicycling, walking, or transit will result in congestion reduction. First, cars consume an enormous amount of space (a person in a car consumes 19 times more space than a person in a chair – and up to 100 times as much space when the car is moving). That means that only a tiny handful of motorists are needed to congest a street. Which means that nearly all cities worth their salt have a “congestion problem.” And that those which don’t have such a problem are showing a sign of being sick or otherwise dying, or at least losing attractiveness. It has been shown over and over again by researchers such as Anthony Downs and Todd Litman that (in any city that is not in decline) we see that space freed up when motorists become non-motorists is almost immediately taken by newly-recruited motorists who had previously been diverted by the congestion (via induced demand, or, as Downs would say, the “triple convergence”). And when the congestion fails to decline despite lots of time and money spent on non-car travel, the pro-car and pro-sprawl advocates quickly point out that these non-car efforts are a naïve waste of time. And that we should get serious and opt for the realistic (and default) solution: road widening. Given the above, it seems to me that the progressive tactic is not to claim that promotion of non-car travel will REDUCE congestion. No, I believe it is much better, tactically, to point out that we need to establish ALTERNATIVES for those who wish to escape the (inevitable) congestion: rail trails, connected streets, compact and higher-density housing near jobs, HOT lanes, flex-time work schedules, etc. As an aside, there are many benefits of congestion for cities (benefits that are undercut when we fight to reduce congestion via the traditional tactics of widenings or signal timing, etc.). But I’ll not get into that now.